Yesterday, Feb. 27th was my dad’s birthday. Though he suddenly left us on Labor Day weekend of 1996, I have never had a day that I have not had some sort of conversation with him. I might tell him thanks for teaching me something. Or I remember how we cleared all our land with a dozer and then spending hours, days, weeks and months with metal 5-gallon buckets pickin’ up rocks and roots. Hauling rocks and roots to draws to make crossings or dams to hold the soil during heavy rains. I had one of those little Ford tractors and a home-made wagon to haul my rocks and roots around. That little Ford tractor could go anywhere it seemed. Give ‘er the gas, work those brakes and we could hop from one rock to the next and never get stuck! It truly was a goal to never get stuck so that you didn’t have to walk home to tell dad, “Uh, I’m stuck.” It was the only tractor we had, so getting ‘un-stuck’ was never easy or a task that left you feeling ‘warm & fuzzy’. 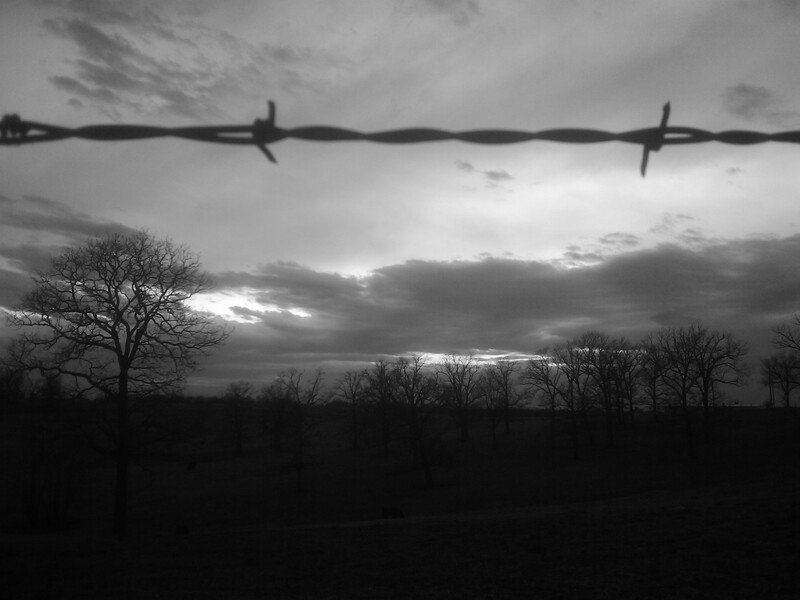 I can still hear my dad say when we were building this place’s fences, pens, whatever…”That’ll last while I am here. After that, the next guy can fix it.” Guess who that, ‘next guy’ is! Since my dad left us, that ‘next guy’ has put shut-off valves on all the underground water lines and at various other strategic places. Whoever comes after the ‘next guy’, well, their life will be somewhat easier. I wonder what will happen to this place once I am gone? I think the sad & happy part of it all is that they might not ever know the satisfaction of ‘all the memories in every step’. I guess I best get back to work. Gotta see if I can locate some expensive hay so that I can try to make it one more month. I wonder what it would be like to not have to face a day with some sort of stress? Mother Nature, you are a challenge…aren’t you. Ever had a day that got shot to pieces before it really got started? That’s our day today. 6 a.m. dash to the barn to see if we are getting puppies…at the door, hear a cry of despair…one of my 3 day old pups is away from its mom and kinda chilly…move it…do a head count all looks okay…pick up the little ones…OMG, one is stiff as a board, cold, mouth gapped…shove it in my coat…head to house…plop it in some warm water…get milk supplement mixed…no movement…heat up the water again…towel it off…nothing…shove it under my shirt, pick up coat, cap, milk mix, bottle, get in pickup, drive to other place…get out hair dryer, warm it up slowly…need to mix new milk…stroke it, mix milk, fix coffee (multi-tasking! )…back to hair dryer, pup shows signs of life (ha, it moved)…3.5 hrs. later…pup on heating pad, takes a couple tugs on bottle, rub its wee-wee, yep – pee’d (that’s good), back to heat pad…OMG — what a day and haven’t gotten anywhere yet…glad I am not calving right now…this is where life gets i n s a n e … hope you all are better than I am today !! Here is just a glimpse of our Monday. Seemed like a day of buzz here, buzz there with my ranch chores. I had some “off the place” errands to run and it just seems like there are not enough hours in the day. Sure glad the days are getting longer. We were to get a touch of rain, and with the strength of the wind, the few 10 p.m. raindrops barely touched anything as they flew by! 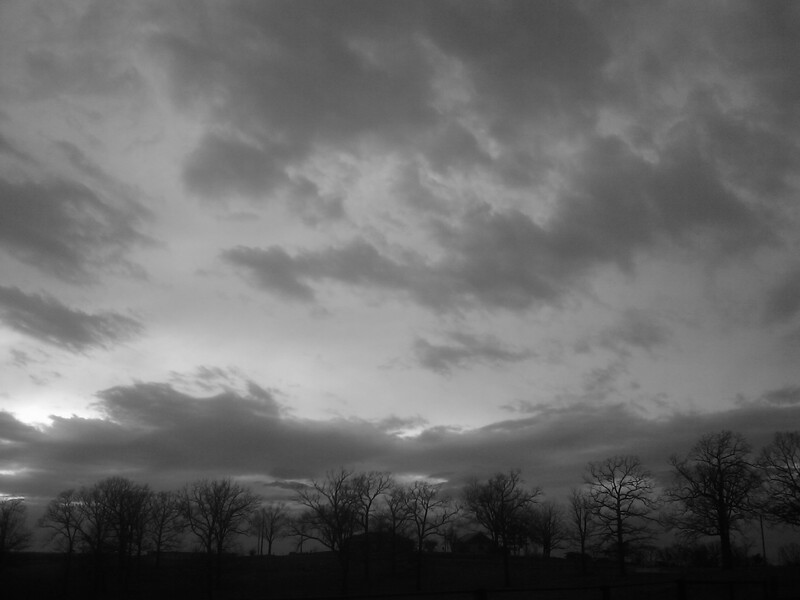 It was a somber day too. Thought of my dear pal Bert, God rest his soul, and had to admire his son Bandit for becoming a real trooper. Sitting on the flatbed in his dad’s old spot. Paying attention to the cattle as they followed the route to the daily hay feeding. Life goes on I guess. As our day drew to a close, the wind pushed the clouds away for a brief 5 minutes – maybe 5 minutes. 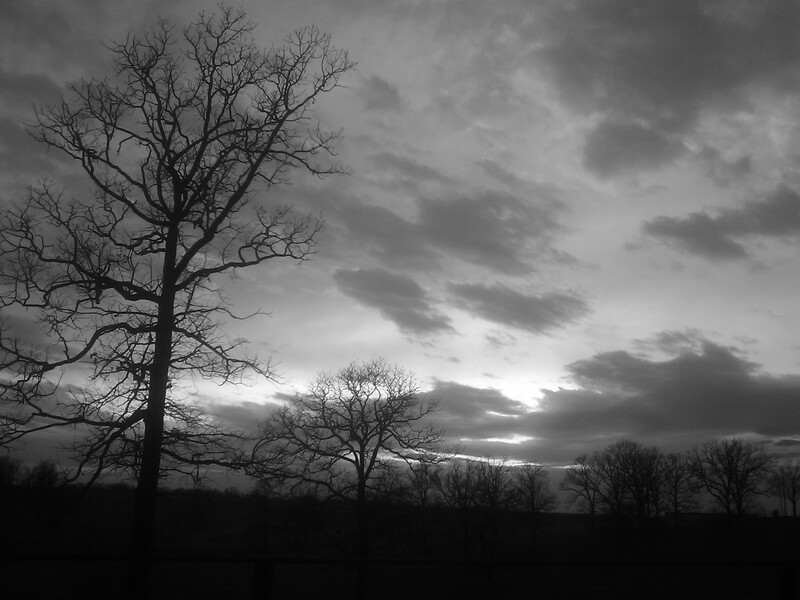 Then the clouds returned…moving lower and faster and in the opposite direction. 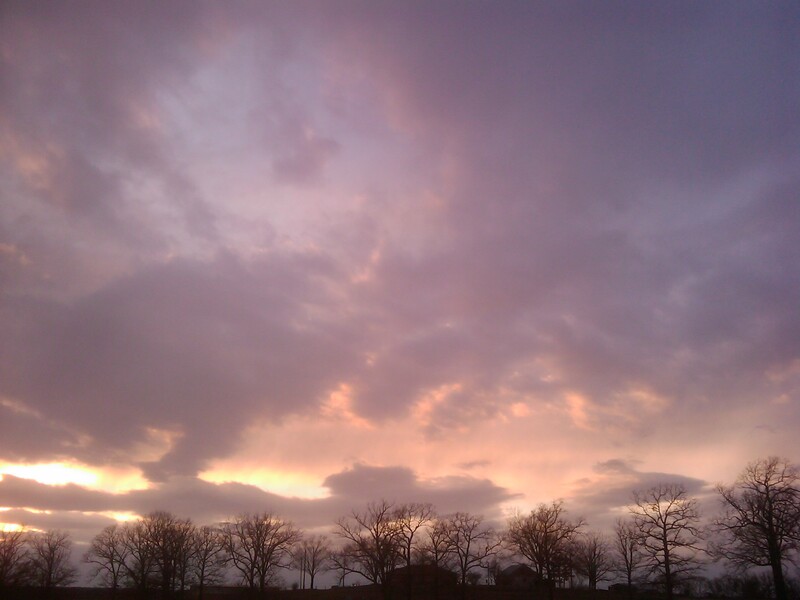 All of a sudden the pastel sky turned darker and the clouds that had left to the SE were not racing back to the NW. I guess they were confused…lol. It just seemed appropriate to shoot a few frames of the pastels turned dark. Life goes on I guess. Sunday we were out the door before the crack of dawn. 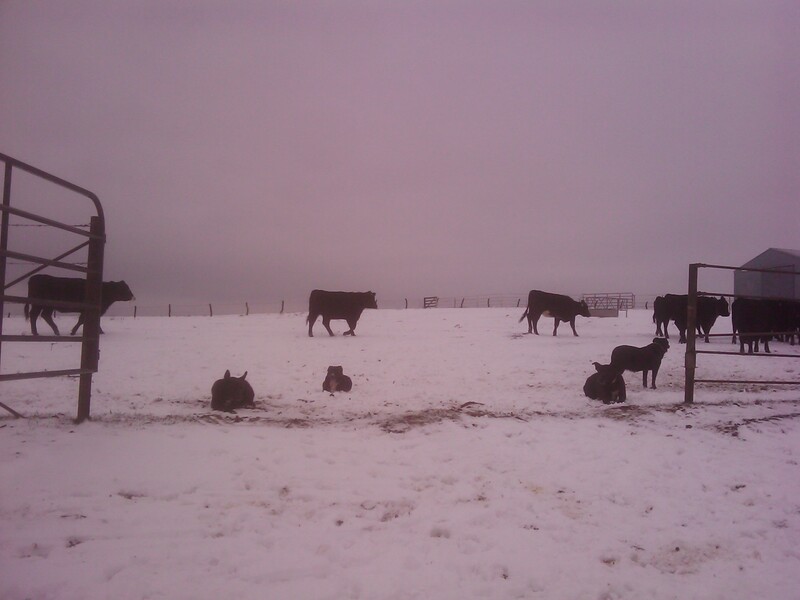 We had to get some calves fed early so that they would be ready to gather and ship by 4 or 5 p.m. Being a bit chilly I grabbed some of my favorite Fox River (made in the USA) socks…and I skipped the liner socks since it wasn’t ‘that’ chilly. 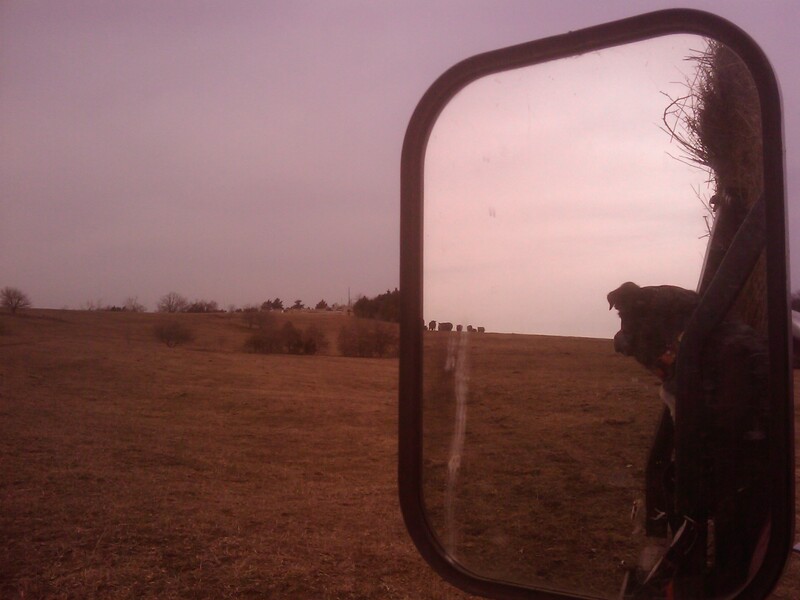 Off I went to get some of my older, regular cowdogs…Bandit, Levi, Ducchess, Jewel…and of course Hawk was along. I fed Ducchess’ puppies their morning milk concoction and gave the “Load up” to everyone else. Varoom…off went the cowdogs to the pickup. 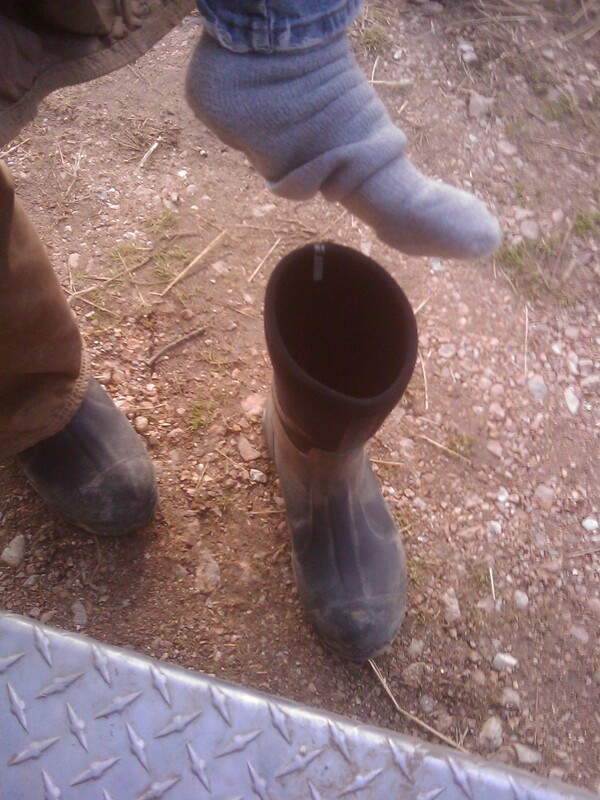 Now, I am thinking that something is going wrong in my boots. Feels like my socks are working their way clear to my toes. Can’t be, not my favorite Fox River socks! I get to the grain bins and I feel like my heels are hollering at me, “Hey, hey…the socks are about to leave us!” I think to myself, “I don’t have time for this today.” I have to get 4 hours of cattle chores done in about an hour, get to church, take care of some things after church, get home and get back to cowdog chores, gather calves by 1, sort steers and heifers, run through my checklist of “who stays, who goes”, get the trailer, load cattle, haul cattle, get home, take care of my cowdogs before dark, work on some stuff for church. So, having cranky socks is ‘not’ on my list of things to take care of today. I check my socks. Yes, they are crawling to my toes. I wonder again, “How can that be?” I fix the socks. I take about 20 steps and I can feel them crawling away again. 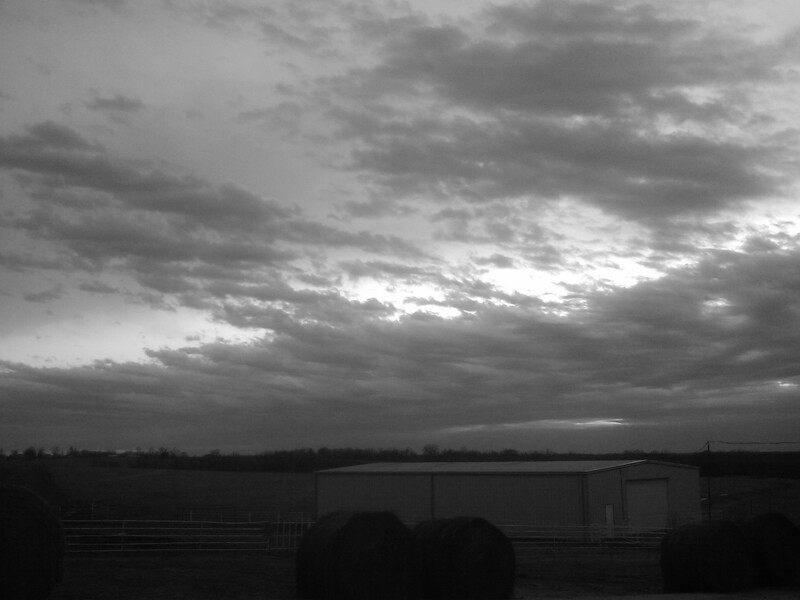 I go ahead and feed some heifers and try to convince myself, “Look, it could be worse. Just go on.” I take several more steps and decide, in a flash, “No, I cannot do this. I hate having my socks floating off my feet.” Back to the pickup I go. Ah ha, there on the gear shift…duct tape. The almighty fix’r-up’r. One wrap later to each ankle. Woo hoo…try coming off my feet now “my favorite Fox River socks”. See, not only does duct tape take care of the “V” in the tree where the heifer kept sticking her head (see my earlier blog!) 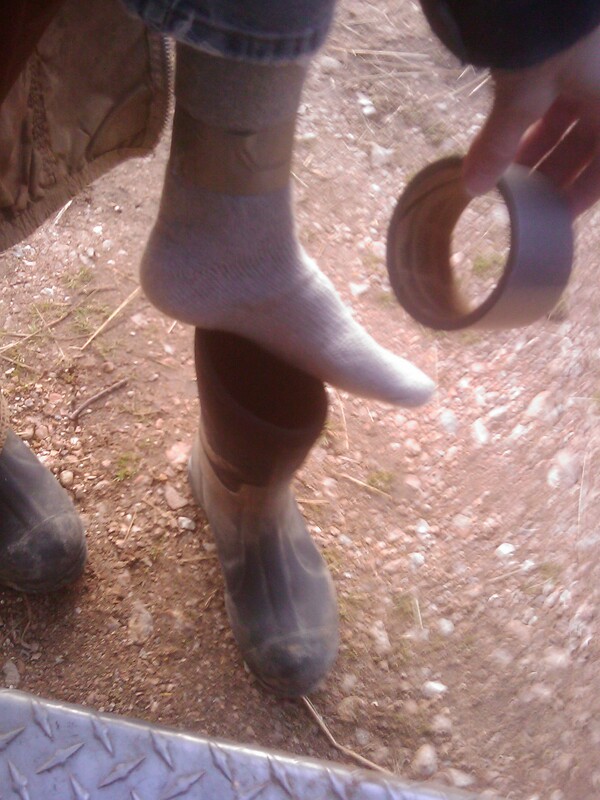 but now the ‘almighty duct tape’ has saved the day for me and my feeties. “Thank you,” duct tape. And the rest of the day went off without a hitch. All the things I had rattled off in my head that I needed to get done…well, we got them all done! Baxter Black recently had a story in the Western Horseman about the Hangin’ Tree cowdog that his friend Darrie had gotten out of Missouri. Darrie (Darian) got her pup from me and has just been amazed at how smart she is. And, from Baxter’s article, we read of the pup’s mischief. I couldn’t help but think that my socks and duct tape would make a good story that Baxter could relate to. Laughter can be the best medicine. Have a great day out there…and keep your socks up! Yep, got the newest round of magazines. I’m gonna look at all the high res., glossy photos of the glamour life and the ‘writing about the dream’…giggle and smile some…and remind myself that those beautiful high res. photos portray a great life that ‘can be yours, if you got the money’…then I’m going to smile again, lay down the high res. dreams on the pages and bundle up and get back out and ‘live the dream’…dreams go on even when the day is not sunny and bright. 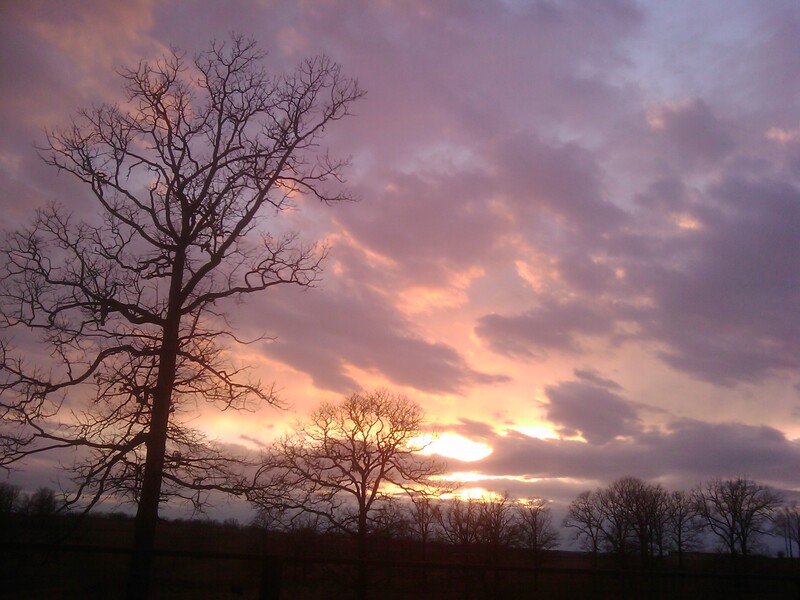 ~Lovin’ The Ranch Life @ Tammy’s Cowdogs! 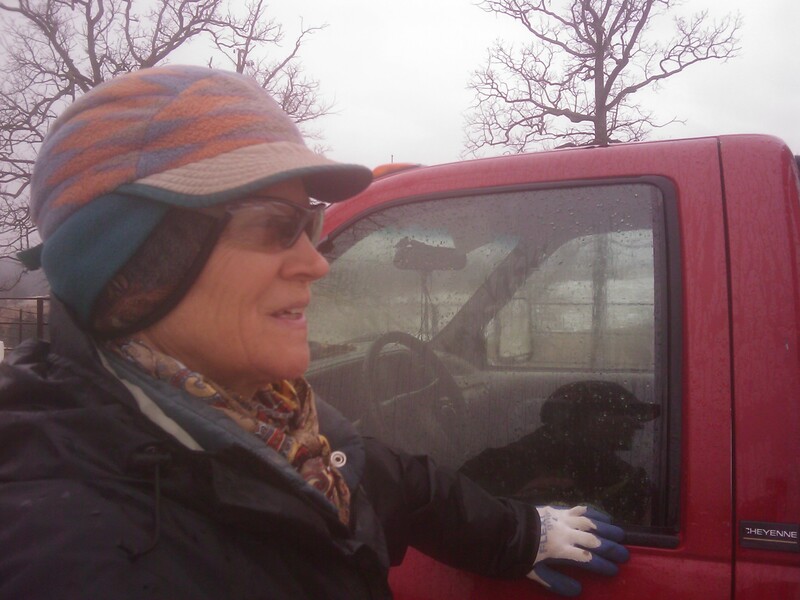 Winter Chores – Tuesday’s Unscheduled Office Events…What A Happy Valentine’s Day! 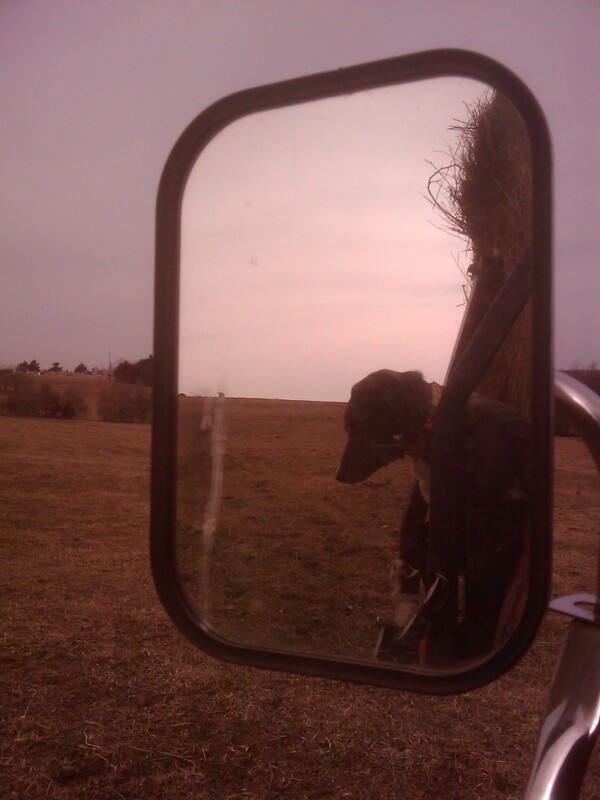 On one of the last hay feeding stops on Tuesday, I noticed the bull was not with the cows. My first thought was, “Sure hope he’s not hurt or dead somewhere.” So, I fed some hay along the lot where I had sorted off and left the calves. My thought was to feed the cows on the S side of the pasture and lock the cows in the S pasture and then go look for the bull. With the cows locked on the S side, then when I found the bull it would be easier to take him to the corrals since he’d go to where the cows were at. I knew the bull was not in the S pasture because there were no tracks in the snow to indicate any cattle were in the S pasture. 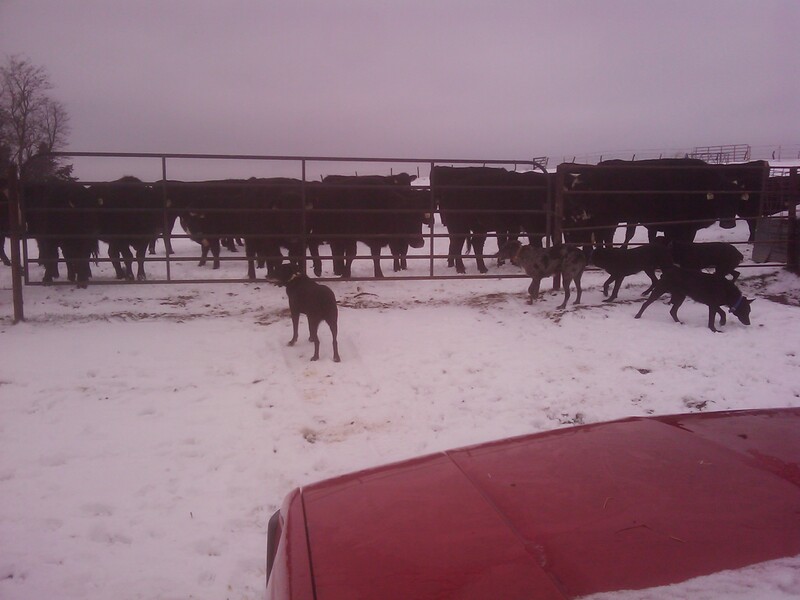 So the cowdogs and I headed out to backtrack to where we fed the cows the day before when it was snowing. There were no obvious signs of the bull. Next route was to head to the hill to see if the cows had actually bedded down and spent the night under the cedars and in the woods where they generally lay on the layers of leaves…the leaves make for a great insulating bed to be off the hard, cold ground. We did find that the cows spent the night in the woods, on the leaves and under the cedars. The cowdogs and I went on to see if we could find the bull in the woods. 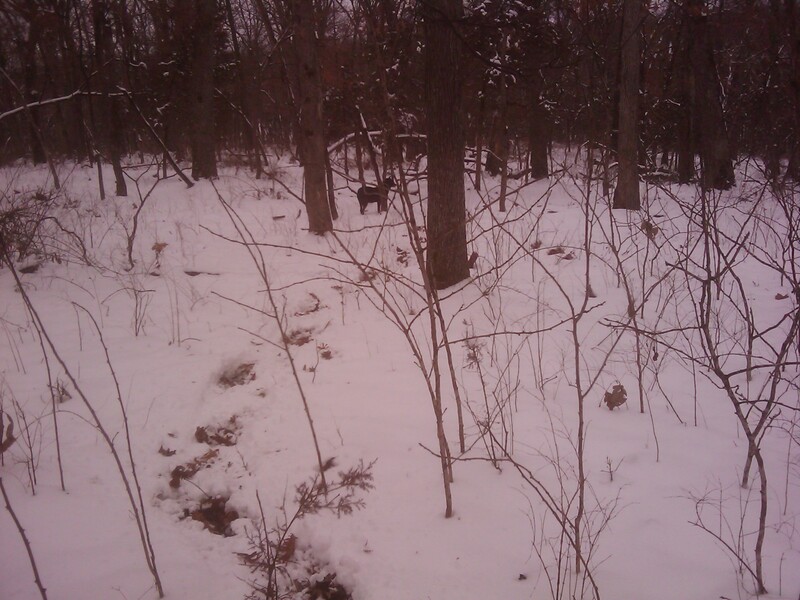 Alas, we came upon a trail of two tracks…big foot tracks and a set of tracks a bit smaller. I gave the cowdogs the ‘trail, find the cattle’ commands. We had not gone far when the cowdogs stopped and with heads held high, bodies motionless and looking to the S, I knew they found something. I gave them a “Shh, shh”. After a few moments, then I too could see…cows and my bull. But, the cows were not my cows! Two cows in heat and my bull hot on the cows’ snowy trail. When the cows spotted me and the cowdogs they took flight to the N. I figured they were going to head to where they had come through the fence…at least, that is what I was hoping! 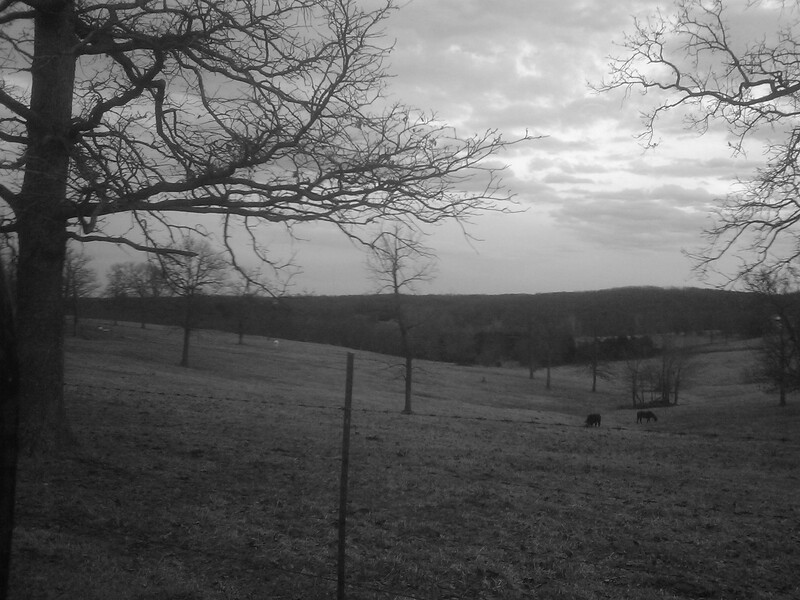 Sure enough, the cows went a good ways and down the hill and out of sight they went. My bull in pursuit. I knew the fence had to be down, and it was. The cowdogs and I followed the trail and ended up about 1 mile away at the neighbor’s place. 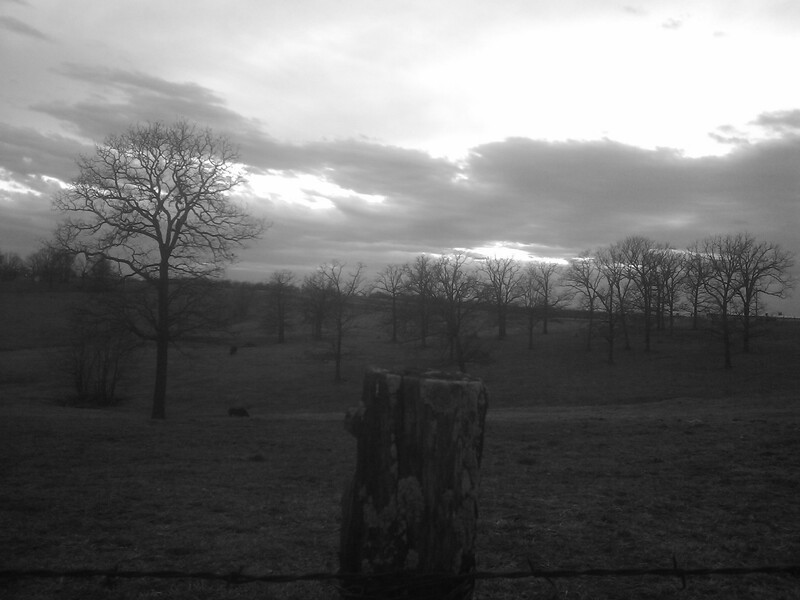 The cows had congregated around a spent hay bale. I put the cowdogs on a “down” and walked on up to a makeshift portable panel pen. I got the 2 cows in heat and the bull sorted off and headed them to the pen. I had already set the panels and secured them so that I could – hopefully – close the opening when they saundered into the ‘trap’. The cowdogs watched patiently, intently and never left their ‘down’. By luck and the grace of God, I got the bull to turn and go in the trap. Now, my hope was that he would stay there ’til I got back. I went back to my 6 cowdogs, told them, “That’ll do. Good dogs. Go on.” They all came off the ‘down’ and headed back along the snowy trail that brought us to this spot. Like leaders, they took me back to where we had to cross the branch of water to climb the steep, snowy, slick hill to get back to the pickup. Next phase of the mission was to return home to get some fencing supplies. We needed 8 posts, post driver, pliers, barbed wire, tie wire, 4 stretchers, heavy Geier fencing gloves, cell phone, 4-wheeler and the trailer. I left 4 cowdogs at home and only took Ducchess and Hawk for the ‘fencing trip’. The neighbor’s fence has not been worked on since about 1968-1970. 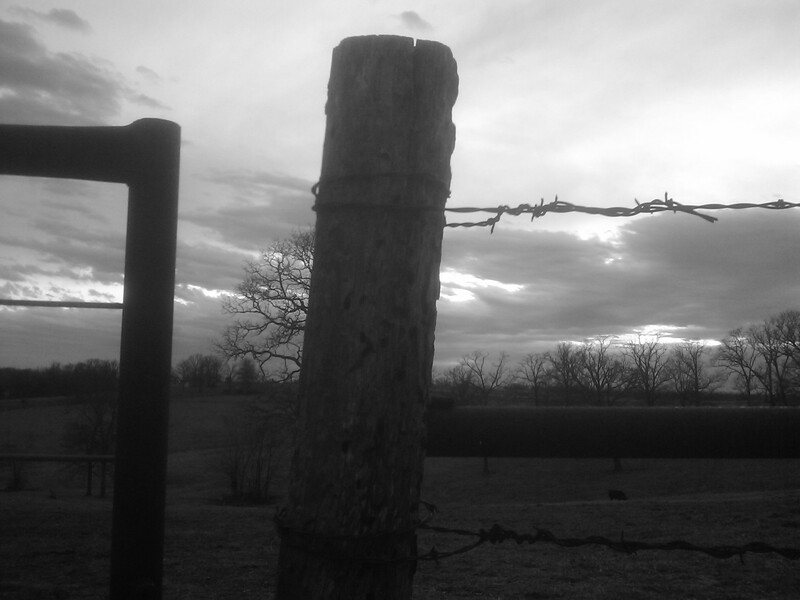 My dad and us kids put the fence in back when we bought the land and cleared a 50′ fenceline path. The posts of the day were red cedars that were split and sharpened so that they could be driven by hand with a post mall…oh, those were the days! My dad was one hardworking fella. He’d swing that heavy post mall with great accuracy and strength…which made me glad because if his accuracy was off, then my hands would get whacked! It’s been a good fence all these years, but it is in a thick wooded area that does not get any sunlight so the posts and wire have all but rotted away. 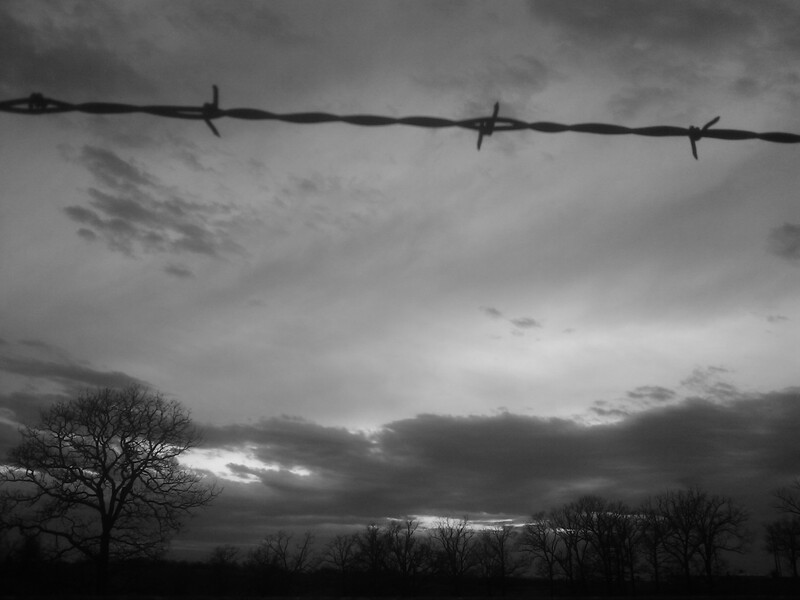 Patching rotten barbed wire is a trick in itself. While stretching the wires back into place it broke up the line a couple of times. So, I had to stop and patch things up before we could finish the job. An hour or so into the project, the neighbor did come along to help drive the t-posts. 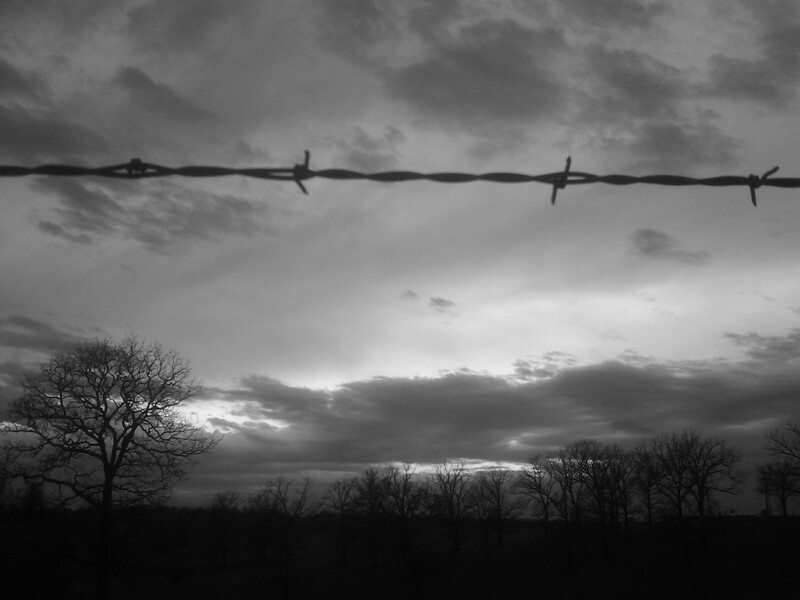 I ran short on tie wire so I tied the top and middle wires and left my neighbor with the assignment of coming back to tie the rest…after all, it is his fence. I loaded up my supplies, my two cowdogs and headed back to the corrals to open the gates to let the calves go back with the cows and opened the gates to let the cows come back in the N pasture. The cowdogs and I roaded on back to the highway and home. We hooked up the trailer, went to the neighbor’s place, loaded up my bull and dropped him back off with the cows on the way home. Pheewww. So much for doing the stuff that was on my list for the day. 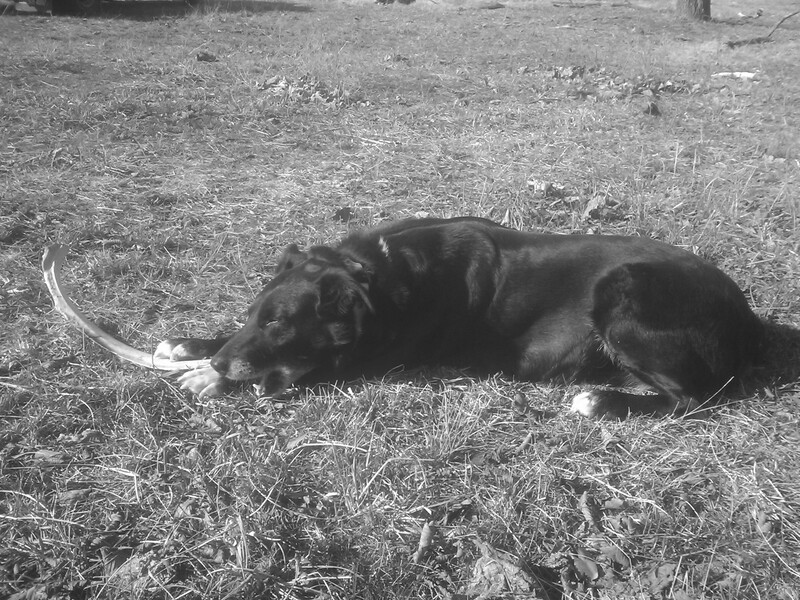 It will have to wait because it was nearing 4:30 p.m. and we still had a couple hours of cowdog and puppy chores to do. I am really lucky that I have such handy helpers. 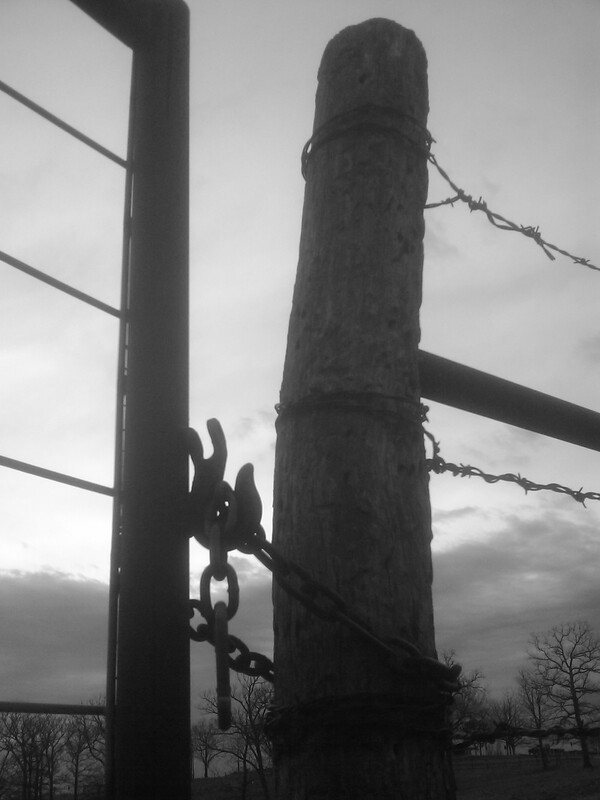 Even if it is as simple as watching a gate while we are out feeding hay to the cattle.